Solaronix offers a complete solar testing environment based on a reliable design with over 12 years of experience developments. The Solixon units benefit from the same steady-state reliability while offering room temperature testing (25°C) and high-end Class A spectrum for sample characterization and aging, this unit combine the functions of solar simulato and light soaking in one unit. Our solution is certified to IEC 60904-9:2007, ASTM E927-05 and JIS C 8912 standards. The Sunirad product line is intended for light-soaking with thermal control of the samples at 50°C. Both product lines benefits from the same exceptional characteristics of the Lumixo named Light engines. A good product must have no hidden cost. 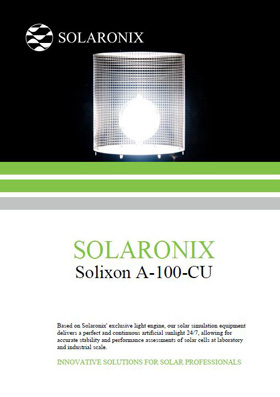 The Solixon equipment from Solaronix generates a perfectly true sun-like illumination, up to Class A rating, over large areas. 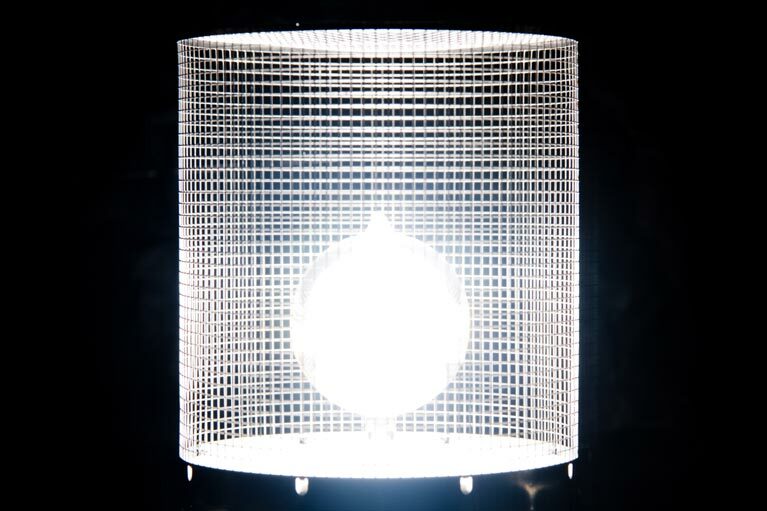 This unmatched behavior enables accurate solar simulation independent of the type of photovoltaic material. It is perfectly suited for the characterization of present and future solar cells absorbing over of a broad range of wavelengths, such as mono and poly-silicon tandem cells, multi-junctions cells, or organic and hybrid solar cells. The Sunirad equipment features Lumixo light engines with an emitter that is spectrally matched to the type of solar cells under test. The Class A units are suited for light-soaking of crystalline silicon solar cells, and for the aging of compound semiconductor based thin film solar cells. The spectral emission of the Class-A unit is specifically suited for the light soaking of amorphous silicon solar cells (a-Si) and standard Dye Solar Cells (DSC). Sunirad A-45 is the low-cost light soaker dedicated to amorphous silicon (a-Si) solar cells, or other solar cells having a similar spectral response. This machine features Class A spectrum, specifically optimized for tandem cells, multi-junctions cells, or organic and hybrid solar cells, using only one Lumixo light engine and additional halogen bulbs. Thanks to an excellent overlap of the Lumixo light emitter with the a-Si spectral response, an actual irradiance of 1000 W/m2 is obtain at nominal full-sun short-circuit current on a-Si cells. 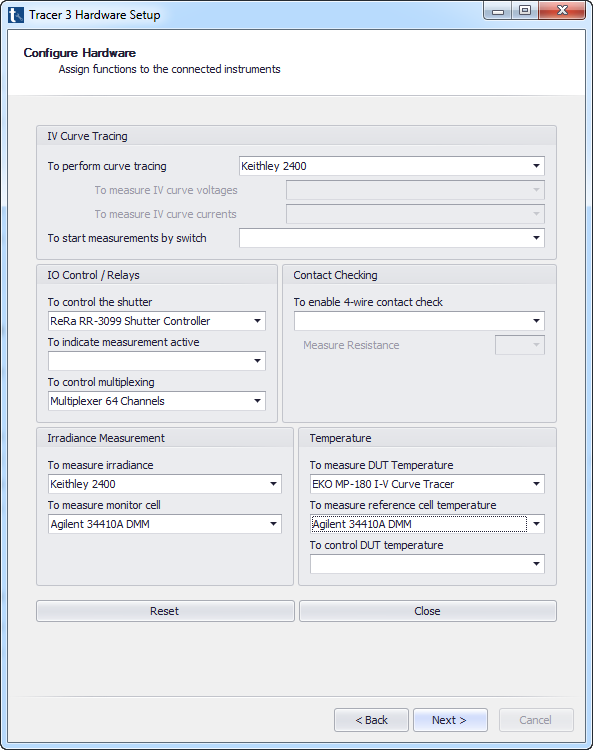 Note: Solar simulator classification is defined as per IEC 60904-9 by three letters describing spectrum, irradiance non-uniformity and temporal stability performances. The computer, the solar simulator, the electronic load and the I-V Measurement software is configured in our factory to ensure easy and fast installation on site. Coupling our solar simulator to a performant electronic load results in high quality measurements which most demanding users require nowadays. 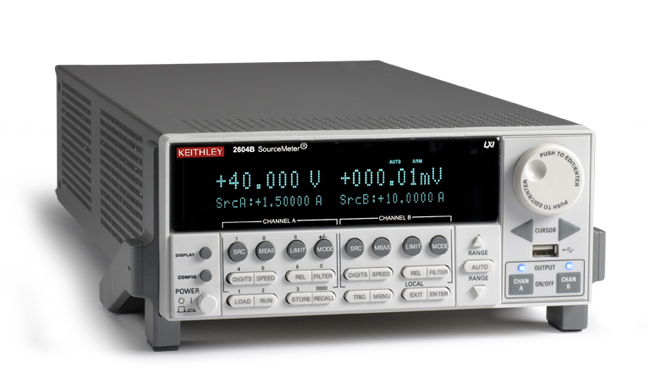 Our IV-System Basic is built around the well-known Keithley 2401 Source meter. This proven instrument has all it takes to measure IV-curves (both dark and illuminated) on solar cells. The available current range has a minimum of 10 pA and a maximum of 1A, where the voltage ranges from 1µV to 20V. Unlike the more expensive Keithley source meters that interface by USB, this instrument can only be controlled by a GPIB interface. In our basic IV-System we include a GPIB/USB interface to make sure there are no issues in getting the source meter connected to a computer. When measuring solar cells it is very important to use a thermostated sample holder. Sample holders prevents heating up of the solar cell material. Another important parameter for solar cell metrology is the temperature. A high precision, class A Pt100 temperature sensor including computer interface (USB) is included with this basic IV-System. Note that the Tracer IV-Curve Software is required to operate the IV-System Basic. 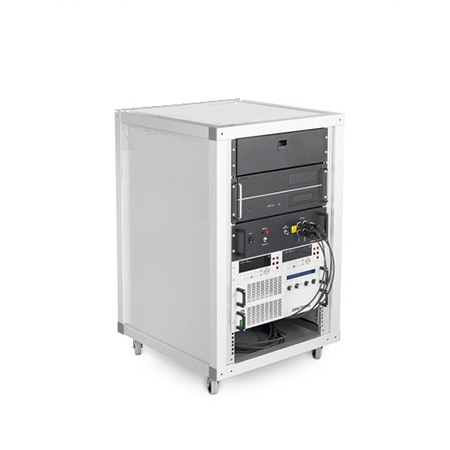 Our IV-System Pro is built around the well-known Kepco Bob bi-polar power supply and 3 Agilent DMMs to realize high quality data acquisition on current, voltage and reference cell. These proven instruments have all it takes to measure IV-curves (both dark and illuminated) on solar cells and modules. When measuring solar cells it is very important to use a thermostated sample holder. By using thermostated sample holder to prevents heating up of the solar cell material. Another important parameter for solar cell metrology is the temperature. A high precision, class A Pt100 temperature sensor including computer interface (USB) is included with this Profesionnal IV System. To ensure a correct powerful control of the equipment, the user-friendly Tracer IV-Curve software is required for each I-V Measurement system. The numerous functions range from doing basic I-V curve measuremens to most advanced analysis. Tracer is the all-in-one solution for the measurement and elaboration of IV-curves for solar cells and modules. 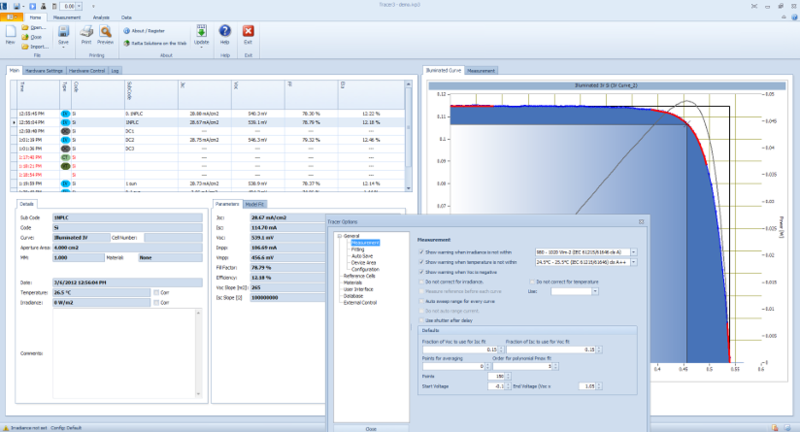 Tracer is the core application that will help you to characterize your solar cells and modules. Many institutes and laboratories all over the world work hard on the development of new materials and technologies for photovoltaic applications. One of the main techniques to characterize these devices is to measure its IV curve. An IV curve can be taken from a solar cell by changing the voltage while measuring the light generated current. It seems logical for this measurement to use a standard power supply, because a power supply is normally used to provide a variable voltage and current. Unfortunately this would not work for solar cells. A solar cell generates current, so you will need to have a power supply that sinks this generated current instead of providing it. This can be done with a so called bi-polar power supply (or electronic load). This is a power supply that can sink and source current at both positive and negative voltages. There are many instruments on the market that can be used as a bi-polar power supply. Some of them are just bi-polar power supplies while others integrate measurement and control capabilities as well. Naturally Tracer natively supports the control of all Keithley 2400 and 2600 series source meters. These instruments have proven their strength over time for the measurement of solar cells. They range from 0.1fA – 20 Amperes. Tracer is developed with the latest Microsoft.NET Technology, which resulted in a modern ‘Microsoft Office' look and feel. A stable operation on the Microsoft Windows platform is guaranteed. Preset configurations are available to ensure fast setting-up of the system. Before you start working with Tracer, you will have to configure your system. This is done by the Tracer Configurator. A tool that completely defines the setup you want to use. Tracer intends to support most instruments available on the market to use as an IV-curve measurement system. You can use for example a Kepco Bop bipolar power supply, add 2 Agilent 34410A DMMs to measure voltage and current, use a National Instruments DAQ card to control the Kepco Bob and get that unused Keithley 2000 DMM to measure a pt100 sensor for the solar cell temperature. This can all easily be deined in the configurator. 1 x Reference solar cell is included with Solixon A-45, Solixon A-70 and Solixon A-100. Additional reference can be ordered according your request. Solar cell IV-Converter (dedicated readout unit for reference cells). 1 x Solixon A-45, Solixon A-70 or Solixon A-100.